In village of Tamaimo, Donna Jaimina González Jiménez, born on 26th July, 1910 has celebrated her 99th birthday with family and friends. 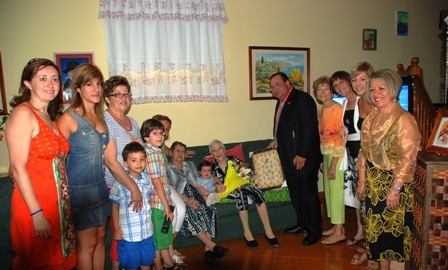 Jaimina is the oldest person in Santiago Del Teide, and her birthday celebrations were attended by the Mayor, Juan Damián Gorrín Ramos, the councillor of Social Services, Beatriz Gonz lez-Navarro, who is also the granddaughter of the grandmother of the municipality, the councillor for Culture, Maria Candelaria Perez and councillor of the People, María Pérez González. The Mayor, on behalf of the council, gave her a bouquet of flowers and a painting commemorating this significant event. Jaimina González Jiménez has 3 children, 5 grandchildren and 3 great-grandchildren and continues to surprise her family and friends with her amazing mental and physical abilities.